K'NEX is the next generation of construction sets. It inspires creativity, builds self-confidence and encourages interaction among children and parents. 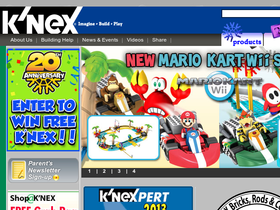 Chech euVouchers.co.uk for all the latest deals for K'Nex products. KNEX.com is now offering up to 50% savings on select sets. Click link to shop. Make sure you sign up for the parent savings membership on KNEX.com because with it you can get great savings, including 25% off parts and accessories. Make K'Nex Education part of your curriculum with free lesson plans on Knex.com. When you shop at Knex.com and spend more than $50, you'll qualify for free shipping with your Parent or Educators Savings Membership.